I thought I’d kick off the beginning of my Scottish Honeymoon Recap by reviewing a set of products that I specifically saved to take with me. I received the invi+apotheke Hair and Body Travel Kit from Beautibi as part of the aNEW box a few months ago, and the peat-infused products seemed like a perfect kit to bring with me to the land of peat and whisky. The brand invi+apotheke is a 100% natural hair and body care brand from Korea that uses peat extracts in their products because of its supposed antioxidant activity from plant sterols in the peat matter. I know that peat makes my garden happy and my whisky delicious, so I was intrigued. The fact that the products are sulfate-free was icing on the cake, as I try to avoid sulfates due to personal sensitivities. Plus, all the products are pH-balanced to be between pH 4.5-5.5, which is ideal for skin and scalp. Personally, I find my body and scalp just as finicky as my face when it comes to pH. So, armed with these adorable bottles of black and grey goo, I made my way to Scotland to get a picture of peat in its natural habitat. Of course, I didn’t manage to hike an actual peat bog, but I did get a nice glamour shot at Inverness Castle. Duly recorded, I figured I could crack them open. These products do not mess around with peat extract. 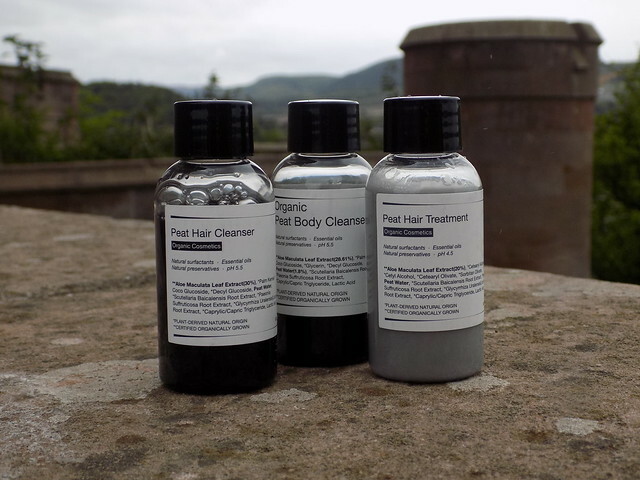 The hair and body cleansers are both deep black in color, and the hair treatment is a satisfyingly dingy grey color that suggests that peat is a large part of the formula. They also have an earthy, herbal smell, although, as one Redditor noted to their dismay, they do not smell of peaty whisky. Nevertheless, I found them quite pleasant, if possibly a bit of a polarizing scent (Mr. Tweed was not so convinced, but still used them). The cleansers are quite gentle and all three products are pretty thin in texture, making for an interesting first day when I dumped out a handful of hair cleanser to wash my hair. They need to be shaken before use, but other than that I find they lather as well as any of my other sulfate-free shampoos, and provide gentle cleansing. The treatment felt a bit lightweight, but I didn’t have any trouble with hair dryness, so it did the trick, although it might not have served me pre-haircut. While I would probably be tempted to repurchase full sizes of the products, they are tricky to find. Beautibi doesn’t carry them. I will also note that, while I like a bit of gentle cleansing for my hair, I did find my hair started to feel a bit gunky after nine days in Scotland with nothing else stronger. I would probably want to use a weekly clarifying shampoo and use these the rest of the time. But it was nice for days when we came home sweaty and I wanted to wash my hair on consecutive days. All in all, I enjoyed these products. I wish they were a bit easier to find in full sizes, though. NB: I purchased these products with my own money and have not been given any incentive to review them. There are no affiliate links in this review, but you can access my affiliate links here.